Posted June 26th, 2013 by Erika Rosenberg & filed under CGR Staff. Summer’s finally here, but just weeks ago students in schools across New York completed state tests that carry bigger stakes than ever before. This is the first year that test scores will feed into teacher evaluations, and with the tests now aligned with the new Common Core curriculum, many observers believe passing rates will decline. The push-back against testing and increased accountability has grown, and it’s easy to see why. Students, families and schools have seen passing rates decline, felt more pressure to increase performance and wondered whether testing now gets too big a space in education. It’s worth revisiting why and how these changes came about, and examining the long-term trend in performance. Posted May 21st, 2013 by Scott Sittig & filed under CGR Staff. Police service is often the most cherished and visible municipal service—and inevitably one of the costliest. When it comes to balancing local government costs and quality of life, law enforcement increasingly is part of the public conversation. Too often, the immediate reflex is to equate cost savings in law enforcement with compromising public safety. That need not be the case. First, there’s emotion involved. We like the sense of security that comes with knowing an officer is patrolling our street. Whether responding to emergencies and criminal activity or getting to know residents on a first-name basis, police form bonds and fill roles that many residents consider vital for their community. Recently I learned some youths in my own neighborhood had accosted one of my neighbors. When I found out how intimately the police officers know the community and possible perpetrators, I could turn my attention away from being fearful for my family and instead focus on community advocacy and intervention. Second, there are dollars and cents involved. Local governments across the country are more constrained than ever by limited resources and rising costs. In New York and New Jersey, for example, pension and other negotiated benefits are driving mandated annual increases that result in many governments bumping up against their state’s 2% cap on the growth in the tax levy. Plus in New York existing police union contracts are further insulated from certain cost pressures by law (i.e., Taylor Law, Triborough Amendment) and unions can exercise a binding arbitration process that has historically produced favorable outcomes for their members. Posted May 13th, 2013 by Kent Gardner & filed under CGR Staff, Rochester Business Journal. After my last column on hydrofracking, I was asked to participate in a forum at the University of Rochester sponsored by Phi Beta Kappa. In my intro, I quipped that I was the guy invited to defend the despoiling of the earth and destruction of the climate. Nobody laughed. This issue has stirred a level of religious fervor that is reminiscent of both sides of the abortion debate. Yet common to most consequential policy questions, the hydrofracking issue (like Oscar Wilde’s truth) is neither pure nor simple. I understand the appeal of clarity and simplicity—we would prefer that fracking be either boon or bane. Complexity makes our heads hurt. Posted April 19th, 2013 by Kent Gardner & filed under CGR Staff, Rochester Business Journal. Higher education is a major contributor to our region’s prosperity. 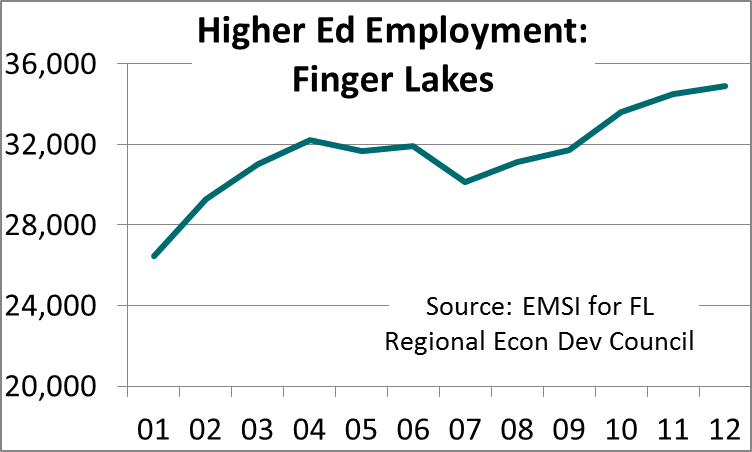 Home to 18 colleges and universities, total employment in the sector rose steadily during the recession and totaled nearly 35,000 last year, up 16% since 2007. Yet Rochester higher ed stands out for more than just job and payroll totals. The community is home to a number of distinctive institutions that set the region apart. One of these, the National Technical Institute for the Deaf (NTID) at the Rochester Institute for Technology, may be better recognized outside Rochester than inside. 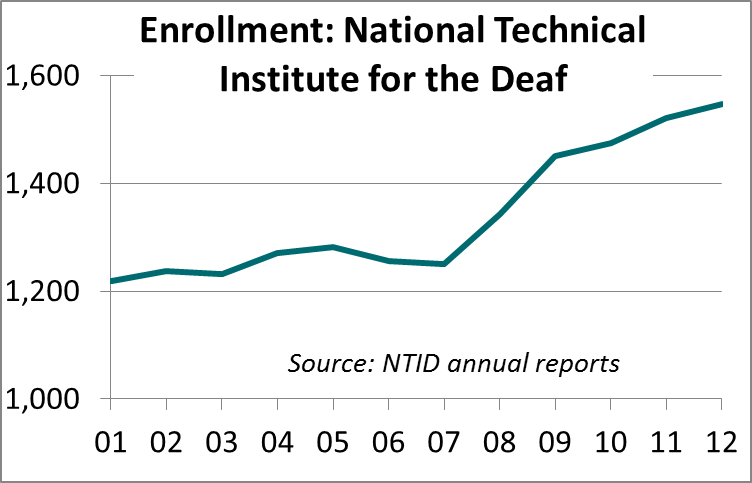 NTID is the world’s first and largest technological college for students who are deaf or hard of hearing. Established by Congress in 1965, the first students entered in 1968. Posted March 20th, 2013 by Joseph Stefko & filed under CGR Staff. Elections bring change – an opportunity to “reset” the policy agenda. 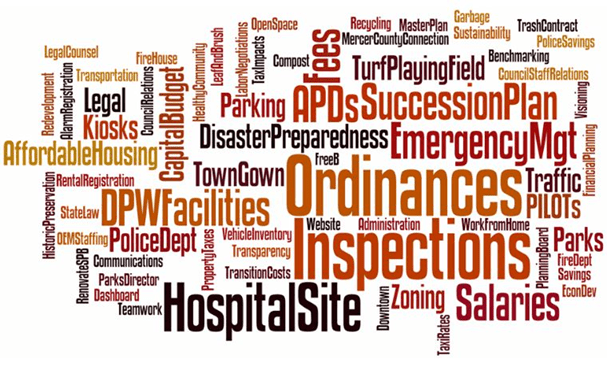 Any newly elected governing body brings with it new policy priorities – some collective priorities shared by multiple members, and some unique ones espoused by individual officials. The key challenge of any new governing body is effectively managing those priorities. Doing it well positions a new government to deliver results; failing to do so invites distraction to the governing process, treating all issues equally and encouraging less-than-strategic governance. Posted March 15th, 2013 by Kent Gardner & filed under CGR Staff, Rochester Business Journal. Workers cast adrift by technology. Last week we learned that the economy added 236,000 jobs in February. Better than a sharp stick in the eye, to be sure. But it still isn’t enough. Average job growth over the past six months has been about 190,000. At this rate, it will take the economy 5 years to absorb the increase in the ranks of the unemployed since 2007, plus new workers entering the labor force. And don’t forget the 8 million working part time who would prefer full time employment, 3.6 million more than in 2007. Posted February 26th, 2013 by Kent Gardner & filed under CGR Staff, Rochester Business Journal. In 1975, Marva Collins founded Westside Preparatory School in Chicago’s Garfield Park neighborhood, a place of persistent and concentrated poverty. Renamed Marva Collins Prep, the school targeted disadvantaged students, many of whom had been classified by the public school as learning disabled. She was able to spur them to achieve at levels comparable to students in high income neighborhoods. Collins’ success was profiled by CBS’s 60 Minutes in 1979 and became the subject of a movie in 1981 starring Cicely Tyson and Morgan Freeman. Posted February 7th, 2013 by CGR Staff & filed under CGR Staff. If you live in Monroe County NY, and especially if you reside in Rochester, you have an immediate opportunity to weigh in on what you want your public library to be. Take a brief survey, developed by CGR, about how to shape Rochester Public Library’s future: www.cgr.org/RochesterPublicLibrary . Just what do we want from a bricks and mortar public library in our digital age? Just over half of Americans, age 16 and up, visited one in the past year, according to the most recent Pew Internet & American Life national survey, and 91% of visitors called libraries an important part of their community. Further, they said they value, in order of importance, books to borrow, reference librarians and free public access to computers and the Internet. Clearly, most of the traditional aspects of libraries—that quiet hush, the many stacks, the quintessential librarian, and (for some decades now) the rows of computers, matter to a great many of us. Posted January 15th, 2013 by Kent Gardner & filed under CGR Staff, Rochester Business Journal. DEC officials told Gannett that these findings were preliminary and did not constitute “final DEC policy.” Fair enough-this is a draft. Posted December 20th, 2012 by Kent Gardner & filed under CGR Staff, Rochester Business Journal. The 1983 publication of A Nation at Risk underscored the gap in educational outcomes between the nation’s disadvantaged and the rest of society, while challenging the nation’s confidence in the entire K-12 educational system by unfavorable international comparisons. We have made little progress in closing either the gap between America’s rich and poor, or the gap between our students and those of other nations.